Be as strong as all other parts that make up the bridle/snubber. Snubber should be properly sized and if done so can significantly decrease the loads on your rode. So for a 40 foot boat in a 60 knot sustained wind storm, worst expected loads as predicted by ABYC would be 4800 lbs, most experts would agree that this is an inflated number that accounts for the dynamic loads that could be induced by waves and wind gust on top of the static wind loads and assumes the worst drag coefficients. ABYC loads already account for the dynamic loads induced by the use of a non-elastic chain a condition mitigated with the use of a snubber. A properly sized snubber can reduce these loads by 2/3. In our example from 4800 lbs to around 1600 lbs for a 40 foot boat in 60 knots. Working Load Limmit for 5/16 Grade 30 Chain 1900 lbs, Breaking Strength 7600 lbs. -Only 22% reduction in peak loads with the use of the 6 foot snubber. 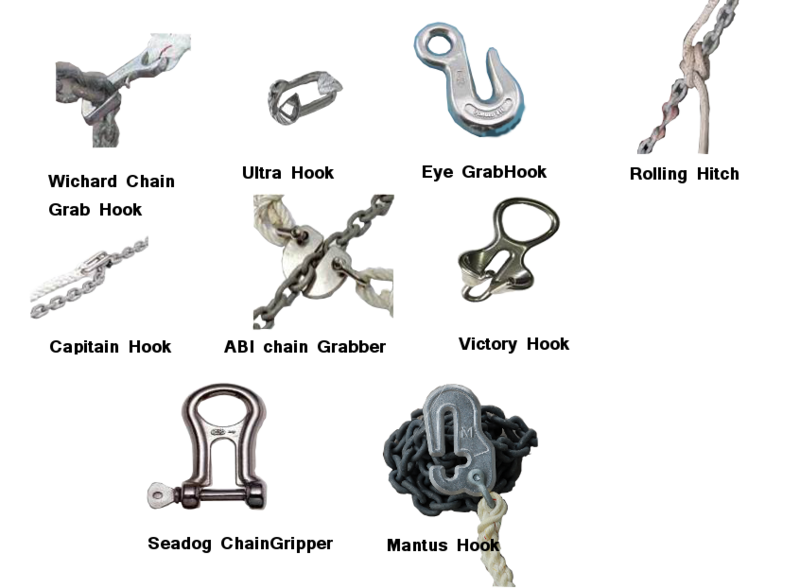 Thus the use of the a properly sized snubber can significantly reduce the loads on your anchor and you chain, by as much as 2/3 with a 30 foot bridle.